The new ecommerce website launched by Childrens Bed Centres in December has a great feature to aid customers in their choice of beds, furniture and furnishings for kids – specific product review. On every individual product page there is a link to a review page on which customers can rate the product on three attributes; ‘value’, ‘quality’ and ‘price’. There is also the option for customers to leave a title for their review and any comments they wish to make. It is the hope that this enhancement will build trust so that new customers can read what other customers genuinely like or dislike about CBC children’s beds and furniture and aid them with making their selection. To promote this feature among customers, Childrens Bed Centres will include every product review placed before 1st April 2012 into a draw to win a £25 voucher to spend on the CBC website. If a customer leaves a review for two products they get two entries and so on, please remember to log in before leaving your review so we know who to contact when the winner is picked. 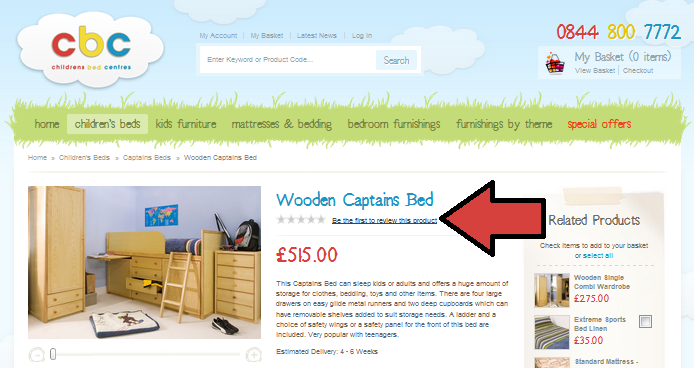 Childrens Bed Centres are offering the chance to win a £25 voucher by leaving a product review on their website. Every review placed before 1st April will be put into a draw to win a voucher for use on the CBC website. The winner will be drawn at random on 1st April and contacted via e-mail shortly after. We will attempt to contact the winner on a number of occasions, if no response is received after 5 working days, we will re-draw. We are also running a competition to win a children’s white storage bed via our facebook page. This beautiful and practical bed is ideal for kids of all ages and is also suitable for use by adults. The built-in storage cupboards and drawers provide ample storage for belongings and the chic white finish suits any bedroom.